unless i go to forums like hardwarezone where Petetherock is a mod, he is super strict on rulings! thank god, Petetherock wasnt given a chance to be a Mod here in xtremeplace!! USD list price is 3999. SG selling less than SGD5K. For HDR, wait till u load Avre custom curve. Night and day difference compared to the standard HDR curve which comes with JVC. Base on the picture I have posted is only on the HYBRID LOG with 4k content . If play movies like Dead pool or Power ranger you can switch to HDR mode the blacks and colour is even deeper and richer. if i or anyone were to use the word "Sell", our post will be removed by mod's here..
but as usual, things magically are avoided by the mod's eye's here in xtremeplace for him..
you have a problem with Pete, suggest you create a new fake news thread so you can trash it out with him. dun come here disturb with uncontructive posts. honestly i will wanna find out too who is fake. Actually I was referring to the built in HDR tone mapping curve in latest X900 series. Though much better than previous series, there is a way to use custom curve to massively improves them. Extensive works have been done @ avsforum. I have not x7900 but my seller told tme he difference is noticeable but if done side by side for contrast. Is the x990r in Singapore ? Yeah i'm keen to get a view on the difference also (X590 vs X990), and any indicative price on the X990. Let me know if u heading anywhere to demo this jvc 990 , I’ll tag along. ya, is the 2k different worth the upgrade. in avsforum, many comment on the x990 lenses quality not consistent. I believe X790 upwards has additional colour filter so the WCG support is even better and should hit 100% DCI-P3 on top of the usual goodies like better contrast, brightness etc. Yeah I think it's because X790 and X990 boast very high contrast ratios and that usually will be at the expense of some top end brightness. Not sure if the colour filter also has something to do with it. I think in general, the decision to spend the additional $$$ for X790 or X990 should be based on whether it will be used in a totally light controlled environment coz if it's not, it's much harder to see the gains from a X590. look like X7900 is good choice between X5900 and X9900. but IFA berlin is coming at 31 Aug, not sure if JVC will have any announcement. 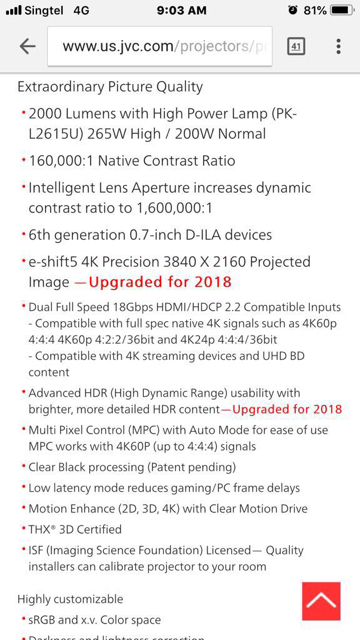 native 4k to counter sony VW260ES and VW360ES?? ?